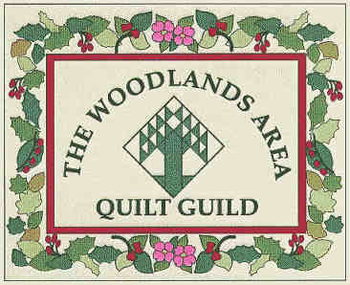 The Woodlands Area Quilt Guild is dedicated to perpetuating an appreciation of the rich heritage and art of quilting. Its goals are to provide a common organization for people who love quilts, to educate the public on the history and artistry of quilt making, to enhance its member’s quilting skills, and to encourage the art of quilting for future generations. Click the link on the left for a Google map and driving directions to general meetings. Social time is 6:30 – 7:00 pm. The meeting is 7:00 – 9:00 pm. During the social time we visit with friends & folks we haven’t seen for a while. The library is also open for us to check out the guild’s extensive collection of quilting books. The meeting starts with a short business meeting to cover anything of importance to the guild, find out the status of any projects we have going on, and bring up any issues that require a vote. We also conduct the Raffle Drawing, the Block of the Month drawing, and Show & Tell. Finally, the guest speaker for the evening takes the floor. The board meets each month at the Friendship Center on the Monday of the week before the guild meeting. All guild members (including those not on the board) are welcome to attend board meetings. To CLOSE map, click anywhere not on the map.